“I will never go to school again!’’, Ali Kachallah, a 12-year old primary school pupil announced when he arrived in Pompomari Internally Displaced Persons (IDPs) camp in Damaturu recently. The boy had earlier attended a public preaching against western education when Boko Haram insurgents overtook his village, Shangamari, Gujba Local Government Area of Yobe, before he fled with his parents to the camp. So, when he arrived in the camp, although there are facilities for education, he had completely lost interest in attending school due to what the insurgents had preached to him. Boko Haram, which literally means western education is prohibited, is the name adopted by the terrorist group — Boko Haram — to depict the group’s hatred for western or formal education. This belief and misinformation spread fast among unemployed youths and the local communities across the north eastern region of Borno, Yobe and Adamawa. Wielding this erroneous campaign, the insurgents destroyed school structure and facility, while their “captives’’ were forced to listen to indoctrination against western education, creating more lack of interest in communities that had been challenged by poor school enrolment. They overtook Shangamari, Ambiya Tasha, Ambiya Kura, Sharlibri, Bulabulin and Turo communities of Yobe on March 26, 2015 and killed 53 people. The already dilapidated primary schools in the area were not spared as the few hanging roofing sheets were brought down by huge fire set on classrooms by the insurgents. In all these attacks, no fewer than 150 classrooms were affected in the communities, displacing numerous pupils and students of the schools. Similarly, in June 2013, 11 students and teachers were killed at Government Secondary School, Damaturu. Barely one month after that, 30 other students died at Government Secondary School Mamudo and in September 2013, the insurgents killed 54 students at College of Agriculture, Gujba. Not only this, 59 students were killed at Federal Government College, Buni Yadi in February 2014, while a bomb explosion at an assembly session in Government Science Secondary School, Potiskum, killed 48 students in the same year. Attacks such as these on schools in the north eastern part of the country then presented danger for continuity in education for young Ali and hundred others who had been indoctrinated by the insurgents. The pupils and their parents, thereafter, developed cold feet to education even when new opportunities were provided in various camps for displaced persons. Worried by the development, the state Commissioner for Education, Alhaji Muhammad Lamin, admitted that the Boko Haram teachings against western education had impacted negatively on the mindset of pupils and their parents. “The state is faced with a huge challenge of reversing the thinking of some parents who had accepted the error created by Boko Haram and developed apathy to western education’’ he said. Similarly, the Chief Imam of Yobe Islamic Centre, Ustaz Hudu Muhammad, the Senior Special Assistant to the state governor on Religious Affairs, Ustaz Baba Gana Malam Kyari among others, expressed concerns that there were more children out of school. They, therefore, called for the rekindling of interests of pupils, students, parents and other stakeholders in obtaining western education. Also, the combined efforts of government, Islamic scholars and the United Nations Children’s Fund (UNICEF), among others, have created a strong force in countering the loathe to education as preached by the sect. Observers note that these efforts have brought resilience in parents and students to continue in the pursuit of education. Also the state government says it has introduced some measures, including shift system in safer primary and secondary schools, to provide students with the opportunity of accommodating displaced pupils. According to the state commissioner for education, government introduces two shifts in the morning and afternoon in public schools in Damaturu and other places as a measure to accommodate pupils who relocated from their villages. 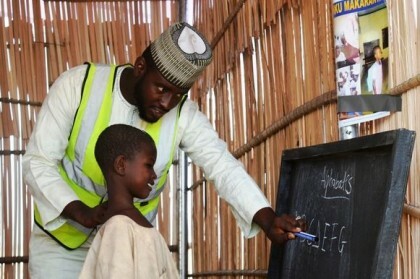 To restore the confidence of the displaced youth in the pursuit of education, Alhaji Musa Idi-Jidawa, Executive Secretary, State Emergency Management Agency, said government established a primary school at the Pompomari camp to ensure continuity in education among the displaced school children. “We have been collaborating with UNICEF and the Nigerian Army who deployed teachers from its education corps to support teaching and learning activities in the camp. “It was a wonderful collaboration that has contributed greatly to continuity in education among displaced school children,’’ he said. In addition, as the state moves into post-insurgency period, the state government had awarded N1.169 billion contract for the reconstruction of three secondary schools in each of the three senatorial districts of the state. In the same vein, Gov. Ibrahim Gaidam of the state said Boko Haram insurgency was becoming history and assured the public that the government would strive to rebuild the schools, provide infrastructures and employ adequate teachers to fast track educational development. “I wish to stress that our administration will continue to accord the education sector topmost priority in recognition of education as agent of social change. “Government will continue to devote greater percentage of the state annual budget to cover the capital and recurrent expenditure of education sector,’’ the governor said. The governor also pledged the commitment of his administration to basic education, payment of examination fees and scholarships for advance studies. To support the reconstruction drive, the Presidential Committee on North East Initiative, also promised to assist the reconstruction of the destroyed schools to fast track educational development in communities liberated from insurgency. With the efforts of the government and other stakeholders, observers note that there are improvements in school enrolment and other educational pursuits across the state. They cite the case of Government Secondary School, Nguru that recently emerged winners of the 2017 National Junior Engineers, Technicians and Scientists competition among the 36 states of the federation as a good development. Similarly, Batotai Abba-Gaba, a primary three pupil at Ali Marami primary school, said he was no longer scared of Boko Haram activities and would do everything possible to pursue his education. Also, Mustapha Aliyu, a student of Government Secondary School Damaturu, said he was more determined to pursue education at every level to improve his life, his family and state. All in all, with about 9, 000 students from the state studying within and outside the country enjoying scholarship from the state government, analysts believe that acquisition of sound education will unlock the hidden treasures among the youth and liberate them for developments.